To begin preheat your oven to 350 degrees. Grease to standard loaf pans, set aside. 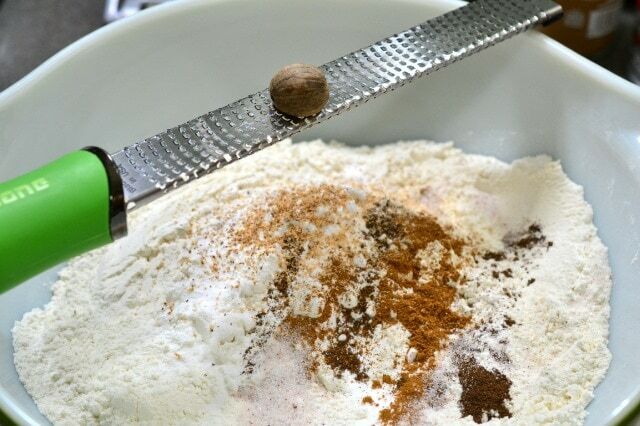 In a bowl, combine 4 cups of flour, 1 tsp salt, 2 tsp baking powder, 1 tsp baking soda, 1/2 tsp nutmeg, 1/2 tsp cinnamon and 1/4 tsp allspice. Stir them together and set it aside. 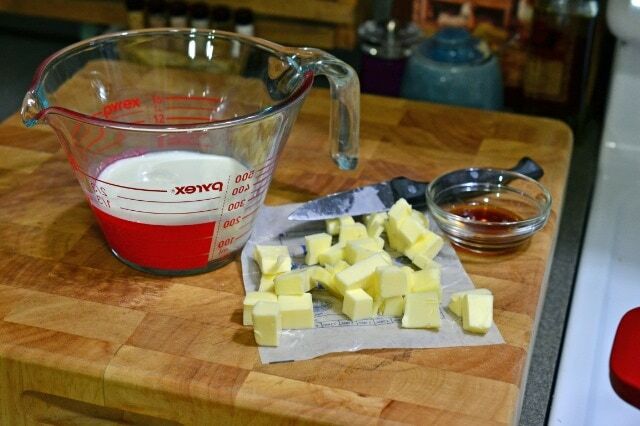 In your mixing bowl, combine 2 sticks of room temperature butter, with 2 cups of sugar. Beat those together until fluffy, and then add in 4 eggs, one at a time. Mix well. 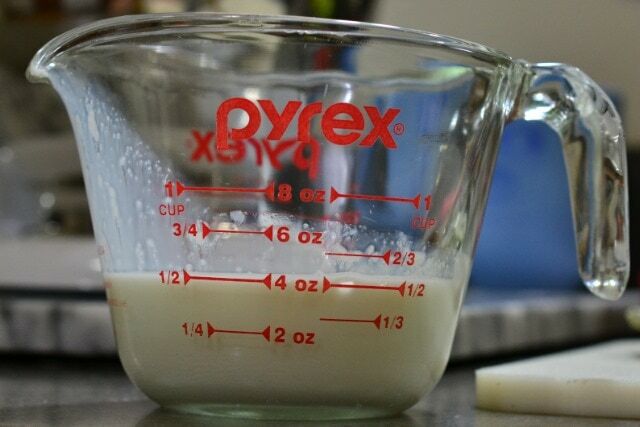 Measure out 1/2 cup of buttermilk, and set it aside for a moment. Now peel and dice 2 Granny Smith Apples. It is times like this that I especially miss having chickens. My girls would come running for goodies like this, when I called them. Mix half of your dry mixture into the sugar mixture, then the buttermilk, then the remaining dry mixture. Combine each completely before adding the next, and stop when it is just combined. Bake them for one hour, or until a toothpick comes out clean when inserted in the center. Allow them to cool for a couple minutes, and then remove them from the pans to a baking rack. Measure out 2 teaspoons vanilla, and set that aside. In a saucepan, you will combine 1/3 cup each of brown sugar, white sugar, butter and half & half. Whisk the mixture together over medium heat, and bring it to a boil. Let it boil for 3 minutes, stirring continually. Remove from heat and stir in the vanilla. Spread the topping all over the tops of the warm loaves. I made this one day a while back, and the fact that it makes two loaves is perfect. One loaf went with me to a meeting, and the other loaf was for the family to enjoy. I have to say, that when my meeting that night was over, I brought home an empty plate. I love bringing home empty plates – it is the stamp of approval for foodies! Another option for this bread, is to make one to enjoy now, and freeze the other for later. If you choose to freeze one, do not put the glaze on. Make a half batch of the glaze, and only put that one the one you will eat now. Freeze the un-glazed loaf for later. Then when you thaw it out in the future, you can whip up a half batch of the glaze and drizzle it on then. Preheat your oven to 350 degrees. Grease 2 standard loaf pans, and set aside. 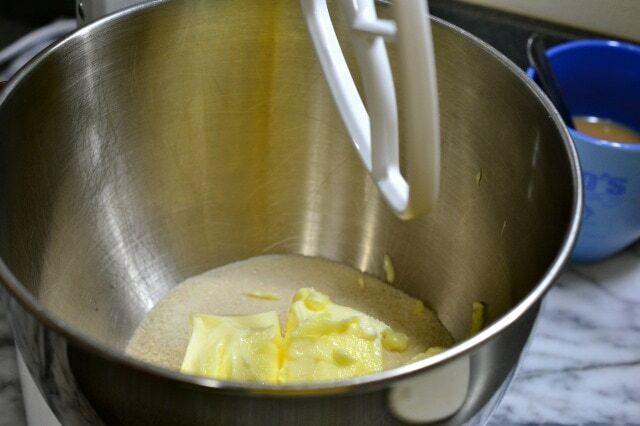 In your mixing bowl, beat together the butter and sugar until fluffy. Add in the eggs, one at a time. 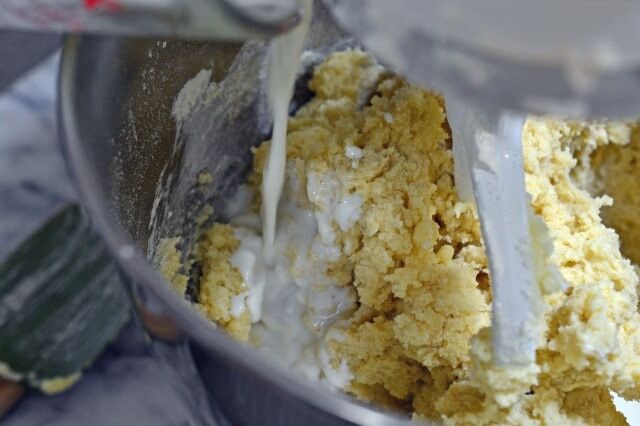 Mix half of the flour mixture into the creamy mixture until just incorporated. Next, mix in the buttermilk, and then finish with the remaining flour mixture, until just combined. 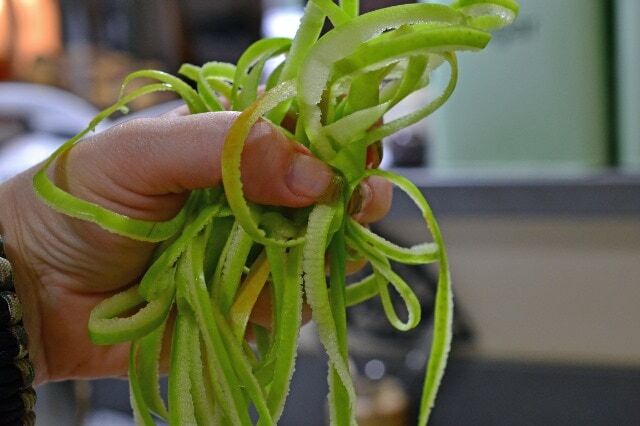 Stir in your diced apples. Spread the mixture into the loaf pans, and bake for 1 hour or until they test done with a toothpick. Allow the loaves to cool a couple minutes, and then remove them from a pan, to a cooling rack. Prepare the topping. Measure out the vanilla and set it aside. 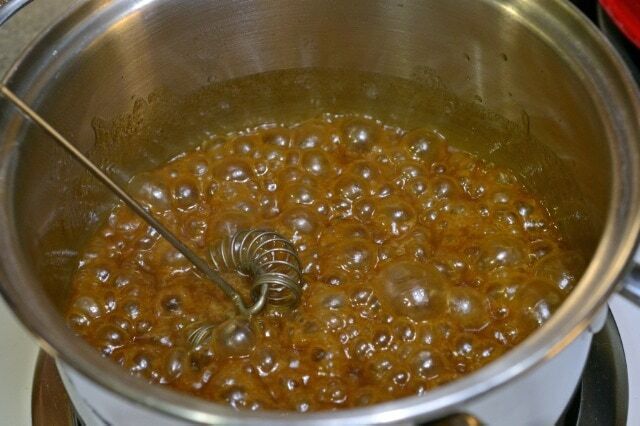 Combine the remaining ingredients in a saucepan, and melt it over medium heat, stirring with a whisk. Bring it to a boil, and let it boil for 3 minutes. Remove from heat and brush over the tops of the loaves. Previous Post: « Chicken Breeds | What Kind of Chickens Do I Have? Connie thank you for posting this again! 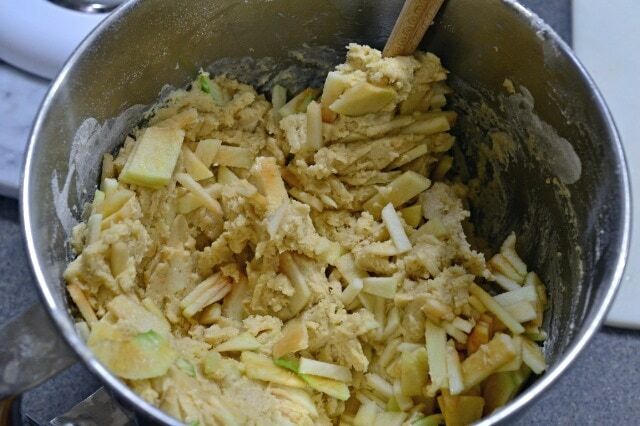 For the last couple of days I have searched for an apple bread recipe. I pulled an apple cake from the oven a few minutes ago, and while it’s good, it’s just ok. I found your recipe just now and had to laugh at the timing. This sounds wonderful and I have the ingredients to make it. Can’t wait!! (I have an apple peeler/corer too) thank you. The directions are mis-stated. 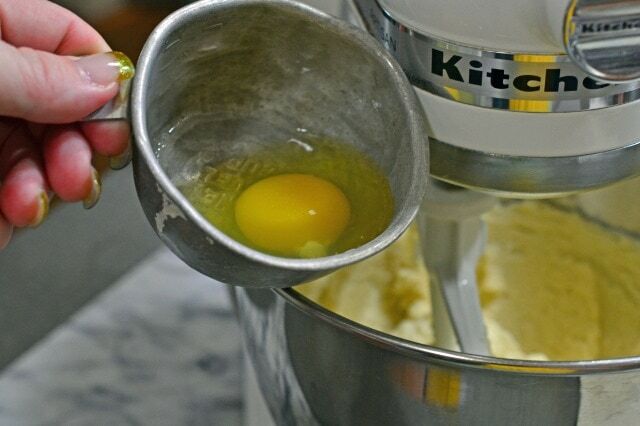 "In your mixing bowl, beat together the eggs and sugar until fluffy. Add in the eggs, one at a time." I believe it should say beat together the butter and sugar until fluffy, then add the eggs". 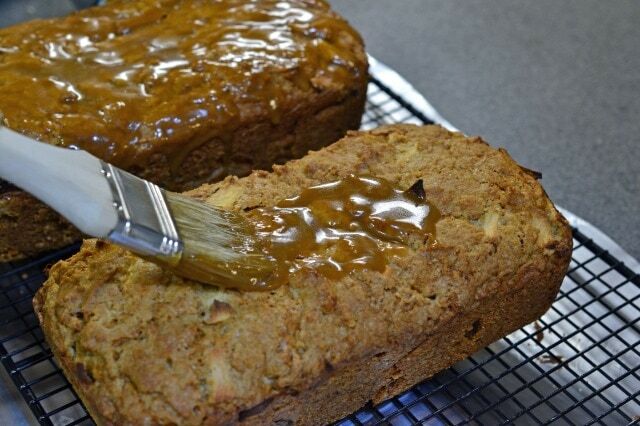 Wonderful Caramel apple bread especially the topping…….so tempting! I want to lick my iPad! OMG! That looks killer! A slice of that would totally brighten up winter :) Love anything with caramel and apples. Absolutely delectable!! I love the caramel oozing down the side. Too bad I don't have apples in my kitchen right now, or I would be running to make this. Mmmmmm….apples and caramel! Totally irresistible!!! And SO enticing with the dripping caramel topping! As I sit here eating an apple I totally wish I had a slice of this caramel apple bread instead. Yum! Dulce the Leche and Caramel is kind of the same right? I think so dulce de leche is a bit more creamier. I like the idea of using it as a topping, the apple bread surely looks fantastic and I am tempted to have a slice now. 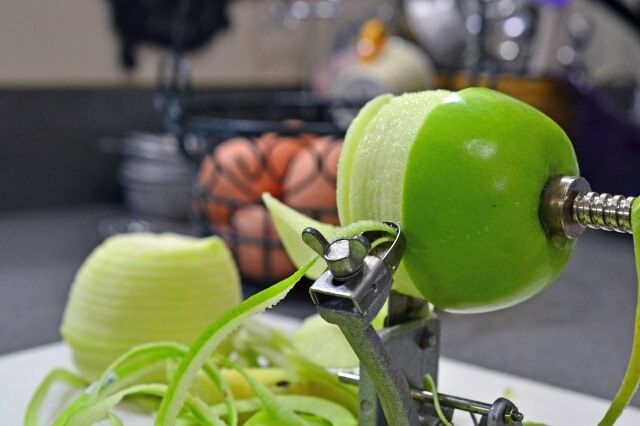 I bought the apple peeler-corer-slicer from pampered chef years ago. They still sell it. I have seen similar ones sold other places, too. It is very handy! Nothing is better than when you turn around and see your plate is totally empty (or with a couple of crumbs). I can see how this bread would do that disappearing act really quick. Yum! Delicious! !i'm drooling looking at your last pic :) So so good!! Absolute DROOOOL! This is so beautiful. Yummy! I would have no self control and eat the whole thing. After all, it has apples, so it is healthy…right…ha! I think I seriously just drooled on my keyboard over that sauce! Gorgeous! Even if I was by myself, you probably would have left with an empty plate. YUM! 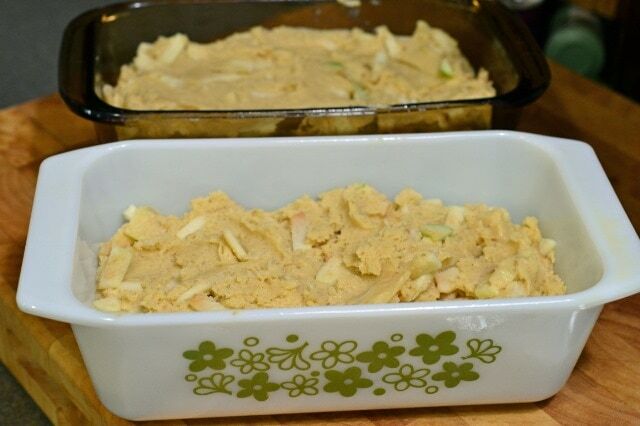 This is like the perfect idea for apple bread! That caramel dripping will haunt my dreams tonight! Oh my word, this bread is insane! I just want the grab a spoon and dig into that glaze! Apple and caramel are one of my favorites. Look at how ooey, gooey lovely it is! !